For the last several years the industry has been wrestling with the issue of how to increase boating participation. Through the Grow Boating Initiative, leaders created task forces to address water access, developed a dealer certification program and embarked on a marketing campaign. However, some say not enough has been done to tackle another key factor in keeping existing boaters and attracting new people to the sport: hands-on training for boaters. “I think there’s definitely a need for hands-on education,” said Capt. Russ Cohen, founder and president of Boatboy Marine Training in Moorestown, N.J. Many states have laws for mandatory boater education, but Cohen and others say these classroom-based courses aren’t enough. Capt. Rick Kilborn of Boatwise LLC in South Hampton, N.H., believes hands-on training “does a tremendous amount” for the confidence level and temperament of the entire family. Each of these schools provides training on the customer’s boat to teach them the nuances of their individual craft: how the boat handles, anchoring, fueling, emergency scenarios, running aground, navigation and docking. Cohen says he and his wife, Lois, and his cousin, Michael Friedrich, started Boatboy in 2001 after seeing the difficulties other boaters were having on the water and at the docks. “We would constantly see people having issues — people screaming at the dock, husbands screaming at wives,” he said. None of that makes for an enjoyable experience on the water, he said. Part of the problem, according to Dowling, is the lack of available time for people to perfect their boating skills. Kilborn, from Boatwise, said hands-on training can help reduce the learning curve. “A good instructor can teach them more in two or three hours than they can learn in months on their own,” he said. Boating school operators say one of the biggest obstacles to hands-on training for boaters is the marine industry itself. Phil Keeter, president of the Marine Retailers Association of America, agreed. But Keeter says more dealers are starting to catch on to the value of hands-on education for their customers. The sluggish economy has contributed to this change in attitude, according to Kilborn. “There are a few quality dealers that are taking the initiative to make training part of boat buying,” Dowling said. Among those is Clark’s Landing Boat Sales of Chester, Md. The dealership formed a partnership with Annapolis Powerboat School last fall. Customers who purchase a new boat (30 feet and larger) can receive a full-day “Cruise with Confidence” course from Annapolis Powerboat. The course provides personalized and individual instruction aboard the customer’s boat, focusing on close-quarter handling and docking. “We are confident that this course will help new boat owners fully experience the many joys of the boating lifestyle,” said Paul Lash, assistant manager of Clark’s Landing. The dealership was already offering its own “Captain’s Orientation” program before it teamed up with Annapolis Powerboat School. 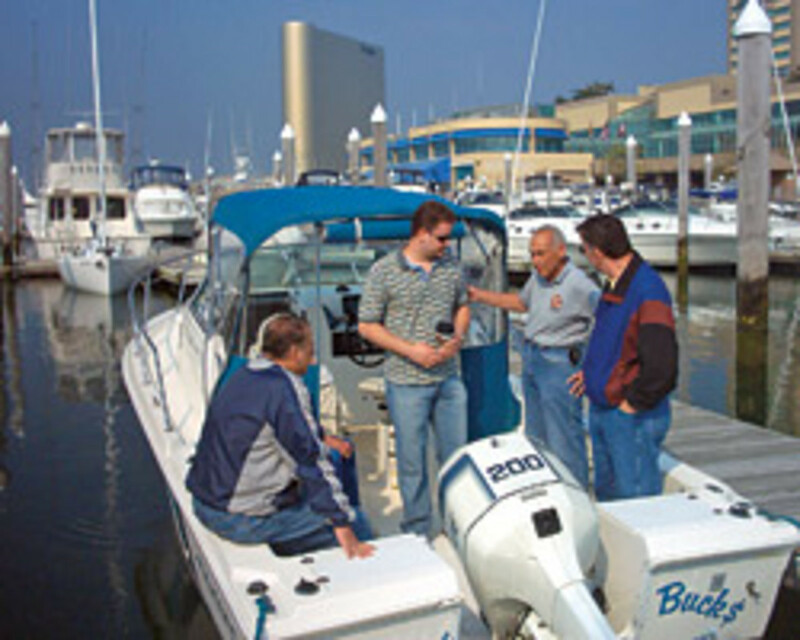 This is a basic hands-on instruction, given at the time of delivery, and covers systems, safety and how to operate the boat. However, basic instruction may not be enough, especially for first-time boaters. Lash said the “Cruising with Confidence” course through Annapolis Powerboat takes the dealership’s orientation to the next level. “We’re trying to making boating, particularly in a small cruiser, available to first-time buyers,” he said. “Anyone with a little bit of instruction can operate a twin-engine powerboat. Lash said the hands-on program is good for his business, good for safety on the water and good for the health of the marine industry. “I feel the industry should be moving in a more positive direction as far as training goes,” he says. Cohen, from Boatboy Marine, also believes dealers and marinas should do more. “I’m not advocating mandatory hands-on education; I think that could be a detriment to the industry,” he said. “I’m advocating and pleading for the marine industry to recognize how important hands-on education is to the industry’s success. Boatwise’s Kilborn says this is especially important because a lot of people with money to spend are buying larger yachts as their first boat. They’re driving 40- or 50-foot yachts without the benefit of first mastering some basic skills on a more manageable, entry-level boat. There’s no argument from Keeter. Hands-on boater education will only help the industry, he said. The MRAA president says dealers selling boats 25 feet and up are doing a better job of incorporating hands-on training into the boat-buying experience, but he said those selling smaller boats could do better. Keeter said trade associations can help by constantly reinforcing the benefits of hands-on training. “I don’t see any downside to this,” he added.